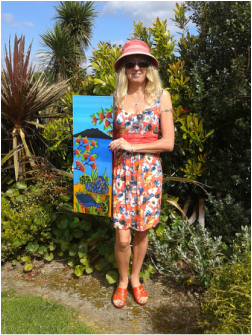 ﻿I am a New Zealand artist based in Whangarei. I create in bright, iconic images made into outdoor garden art on aluminium. These are an affordable feature for any deck or patio or garden. But most people don’t know that all my originals are hand painted on silk. Self-taught, I began painting when I was 16 & settled on silk painting in 2000. Inspired by Northland the beauty of our coves and rock formations out at The Heads &the beaches in the near and far north, I mainly paint New Zealand coastal scenes, but I also enjoy painting native birds. then any touch-ups or special effects can be done. Steamed again for half a day to set the colours, the silk is then washed to remove any residual chemicals, and pressed, and is now ready for mounting. presentation process that no-one I the world but me does, making it exclusive and unlike anything that anyone else has to offer. I also make prints, cards and other related art items, all made at home . Although my studio is private, I exhibit my work in selected exclusive shows and galleries all over NZ, and occasional markets and shows.